Editor's note: This week our Google for Education team will be joining thousands of educators at the BETT educational technology conference in London. Follow along on The Keyword and Twitter for the latest news and updates. Education is evolving, and G Suite for Education is too. Today, we’re announcing two exciting updates: a new set of free features designed to strengthen security for all G Suite for Education users, as well as a new edition called G Suite Enterprise for Education. The tools in this new edition offer large educational institutions some of the same capabilities used by enterprises to meet their more complex technology needs. Data Loss Prevention (DLP) for Drive and Gmail gives admins greater control and visibility in protecting their sensitive school data, and the ability to protect users from accidentally sharing confidential information externally. G Suite’s DLP protections include a library of predefined content detections to make setup easy and advanced capabilities such as OCR recognition of content stored in images. Security key management and enforcement offers an additional layer of security for user accounts by requiring a physical key. Admins can now require their institution to log in using security keys to further secure the organization against phishing attacks. Security Keys plug directly into a laptop or pair with a mobile device using Bluetooth or NFC, instead of receiving a code via text. Admins will also be able to manage the deployment of Security Keys and view usage reports, keeping data security all in one place. Hosted Gmail S/MIME gives institutions working with sensitive information an option to digitally sign and encrypt emails. It’s easy to manage for administrators and seamless for end users. It also adds verifiable account-level signatures authentication to better protect against email spoofing. And with Hosted S/MIME, incoming encrypted mail still benefits from Gmail’s extensive protections against spam/phishing/malware. We’ve heard from dozens of large institutions—from private and public colleges and universities, to school districts across the country— that they want access to more advanced tools to meet their technology needs. Whether it’s advanced data and device controls or enterprise-grade communication capabilities, we are excited to be offering an entirely new solution for these customers. 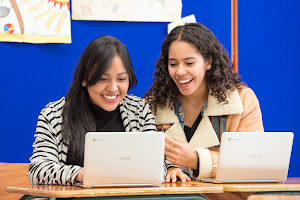 G Suite Enterprise for Education will offer many of the same capabilities available to G Suite business customers in addition to future features geared towards the specific needs of educational institutions. Advanced mobile device management helps large organizations enable proactive management of mobile BYOD devices. With new device rules for Mobile Management, G Suite admins can now define custom rules that trigger on device events, like device updates or ownership changes, and have associated actions. Additionally, admins can review audits and reports of activities on these devices, as well as securely manage work apps on a user’s device while leaving personal apps under the user’s control. Cloud Search provides a unified search experience across G Suite, helping users spend less time searching for information and more time deriving insights. Powered by machine intelligence, Cloud Search surfaces personalized information that helps users stay on top of important work, prepare for upcoming meetings or even suggest files that need attention. Gmail logs analysis in BigQuery contain information that can help education administrators diagnose issues or unlock insights. Admins will be able to run sophisticated, high-performing custom queries and build custom dashboards. With Admin reports in BigQuery, they can also analyze their domains’ data to understand product adoption and usage. Security center for G Suite brings together security analytics, actionable insights and best practice recommendations from Google so that admins can protect their organization, data and users. Admins now have access to a unified security dashboard and can reduce risk to their organization by adopting security health recommendations from Google. Record meetings and save them to Drive. For schools wanting to capture faculty meetings or online lectures, Hangouts Meet can be used to record them and save them directly to Drive making them readily accessible for those that weren’t able to attend. Hangouts Meet supports up to 50 participants. The ability to bring together people across large districts or remote campuses saves time. 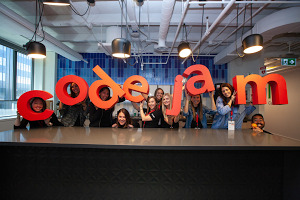 With this edition, teams can connect up to fifty participants on a single video and phone conference. The dial-in feature in Meet allows users to seamlessly connect to meetings via a phone. Whether working from their mobile device or if they don’t have a reliable Wi-Fi connection, users can join via a conferencing bridge that’s automatically added to every meeting. Additionally, it’s now available in more than two dozen countries, making it easy for educators to connect if their institution has a footprint around the globe. Clay County, which has been piloting G Suite Enterprise for Education, is spread out over 601 square miles in northeastern Florida. According to Jeremy Bunkley, Director of Information Technology, “G Suite Enterprise for Education has improved our ability to address critical IT needs that stem from being a large district. The advanced tools in Hangouts Meet have allowed us to reduce costs and save time." We’ve been working with colleges and school districts to pilot both the new free features and enterprise tools, and we’ll be making them widely available in the coming months. 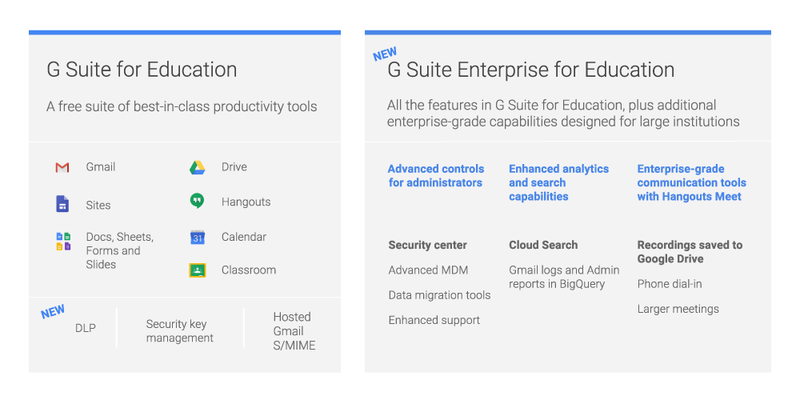 Submit this form if you’re interested in getting more information about G Suite Enterprise for Education. You can learn more about the edition on our website and Help Center.